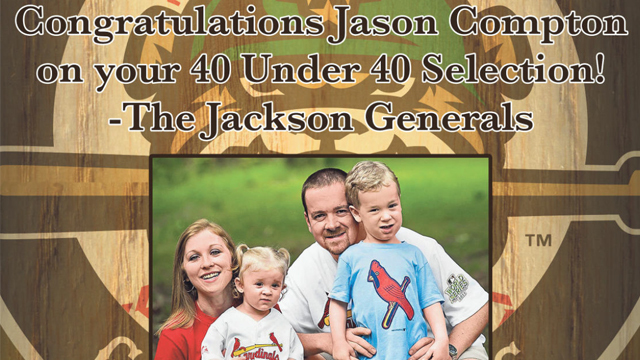 JACKSON, TENN (October 20, 2014) - On Sunday, the Jackson Sun and the Jackson Chamber of Commerce recognized 40 people under the age of 40 who are making significant contributions to their industries, their companies or who are active in the community and have a heart and drive to make West Tennessee a better place. The Generals congratulate each award winner and are excited that Generals' GM Jason Compton was named to the exclusive list. "We are so proud of Jason being honored in this manner," added team President Reese Smith III. "His ability to rise from an Intern to General Manager of a multi-million dollar organization is evident. His management enabled the Generals to have one of their most successful seasons on record, in 2014." Compton began as an intern with the then West Tenn Diamond Jaxx during the 2000 Southern Championship Season and was hired full-time in 2001 as Box Office Manager. He did various jobs within the organization until promoted to Assistant GM in 2008, and then to GM in 2012. "I have been a part of professional baseball in Jackson for 15 seasons and this past season the Generals saw a 13.5 percent increase in attendance over 2013," said Compton. "It was the highest attendance since 2008 and had more crowds over 5,000 (six times) people since 2004." Compton is a 2013 Leadership Jackson graduate and member of the Leadership Jackson Alumni Association. He is also a member of the Jackson Old Hickory Rotary Club. Compton, 35, has a B.S. in Education with his major in Sport Management from the University of Tennessee, Knoxville. He resides in Jackson with his wife of nine years, Autumn, son Carter (5 years old) and daughter Chloe (2 years old). Season ticket packages for the 2015 Jackson Generals season are currently on sale for just $300. For more information, call (731) 988-5299 or visit the website at jacksongeneralsbaseball.com.